This design hostel is located in the heart of Moscow, within a 5-minute walk of the famous Arbat Street and Arbatskaya Metro Station. Free Wi-Fi and complementary tea and coffee are provided. The Kremlin, the Cathedral of Christ the Saviour and the Pushkin Museum of Fine Arts are less than 20 minutes' walk away. There are a lot of cafes, bars and restaurants near this hostel. The Red October district with trendy shops, clubs and galleries is 2,5 km away. Hostel Oh So Indie is housed in the historic building, constructed in the beginning of the 20th century, and boasts its vintage ceilings. It features both dormitory and private rooms with private or shared facilities. 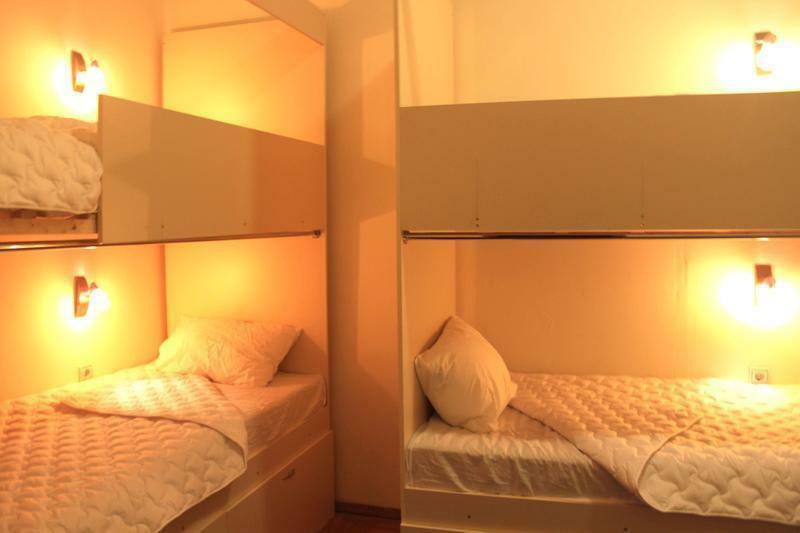 The dormitory rooms feature unique, custom-made bunk beds. All rooms are equipped with lockers. Also there is a piano lounge with vintage one of the world's smallest piano, library and luggage storage. The reception is open 24/7. Then go down to Paveletskaya Metro Station just outside the train station. By Taxi - You can use taxies standing outside the terminal. Taxi fare varies a lot. It can be anything from 1100 Rubles – 2500 Rubles. Beware of private taxi service. They can over charge you. Best way is to book a taxi in advance by phone, online, or contacting us. Then go down to Belorusskaya Metro Station just outside the train station. By Taxi - You can use taxies standing outside the terminal. Taxi fare varies a lot. It can be anything from 1000 Rubles – 2000 Rubles. Beware of private taxi service. They can over charge you. Best way is to book a taxi in advance by phone, online, or contacting us.